Home » Hatches » Deck Plates » Beckson Stow Away Hatch with bag, 5 in. Beckson Stow Away Hatch with bag, 5 in. Best used as a replacement lid and bag for some Wilderness Systems kayaks with a 5 inch hatch. Closes with a 1/8 twist. 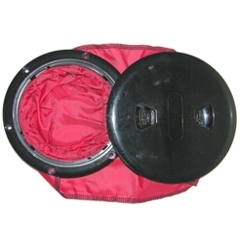 See the Twist-Out Hatch, 5 inch for use as a replacement lid only. 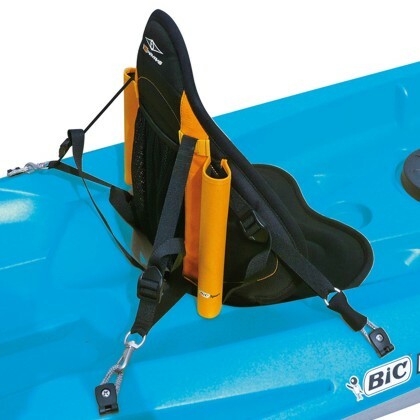 You can add this Beckson screw-in hatch to any flat place on your kayak's deck. Avoid installing in low spots such as tank and cargo wells. You will need: Jig saw, drill, 3/16 drill bit, hand riveter and rivets (or screws, nuts and screw driver), tube of silicone, fine point magic marker, confidence with do-it-yourself projects, a sharp eye and a steady hand. (You can supply your own hardware, just be sure to use stainless steel screws and lock nuts.) Feel free to use the the Ask Tom lik above for location selection and installation advice. Hatch opening is 5 inches in diameter. Rim outside diameter is 6 and 11/16 inches. Fits best on an 6 and 3/4 inch flat area. Lid is 7 inches in diameter. Most five inch screw hatches have the same cut-out template and six bolt pattern. While the lids from one brand of hatch will not fit the rim of another brand hatch, the large hole and six small screw holes on your kayak deck will accept most five inch screw-in hatch brands. If the lid does not fit, remove the old rim and replace it with the new rim. 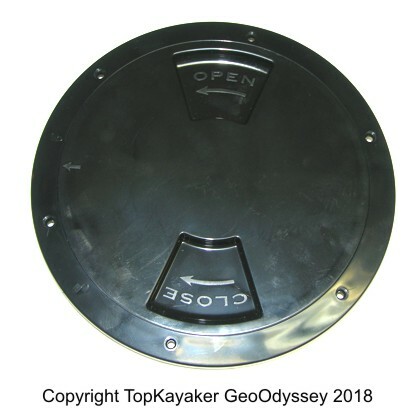 Please see Kayak Hatch Replacement Options Part II - Deck Plates for more info.